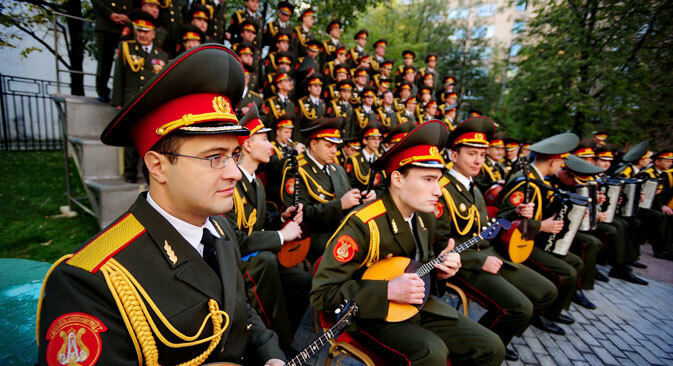 The Aleksandrov Academic Song and Dance Ensemble of the Russian Army hopes to represent Russia at Eurovision 2014 in Denmark. The famous Aleksandrov Ensemble recently celebrated 85 years of performances. In the beginning, the ensemble had 12 people; at present, the group has 186. Now, they have set their sights on Eurovision 2014. Despite the fact that typical Eurovision style is far from the style of the military ensemble, Leonid Malev, the group's leader, is confident that this will not stop the group from conquering the hearts of Europe. The team often performs in foreign countries and is popular abroad. In the Czech Republic, Slovakia, Poland, Hungary, Serbia, France and other countries, the ensemble sells out concert halls. Malev has no doubt that, if the Aleksandrov ensemble makes it to Eurovision, they will find a considerable number of admirers ready to vote for Russia. The ensemble's repertoire includes more than 2,000 pieces, including songs by Soviet and Russian composers, folk songs and dances, and religious music. One of the main challenges in preparing for the competition was choosing the right song. According to Malev, they already have the lyrics; they just need to find a composer who can put their beautiful lyrics to inspired music. The name of the person who wrote the lyrics has not yet been disclosed, in order to build up anticipation. Since the rules of Eurovision limit the number of performers to six, they had to select a team worthy of representing Russia in Denmark. They chose two teams — a main one and a reserve. The soloist of the main team will be Boris Dyakov. The reserve soloist is Yevgeny Bulochnikov. Along with the lead singer, there will also be two musicians from the orchestra and three ballet dancers on stage. Which instruments the musicians will play has also not been revealed. The ensemble will be supported by the usual audience, but also by bikers from the Night Wolves motorbike club. The bikers announced, "If you go, we are coming with you in a whole column of motorcycles." In the meantime, the army ensemble is planning a huge foreign tour. The ensemble will give a total of more than 40 concerts in Poland, Germany, the Czech Republic and Slovakia. In the second half of December, the performers are heading to China to perform. Based on materials from Vesti.ru, Metro and Rossiyskaya Gazeta.